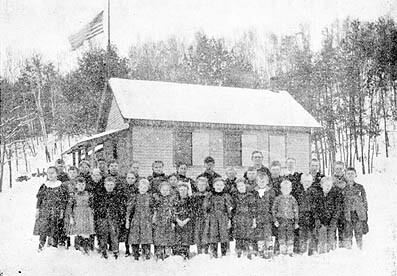 This photo appeared in the April 12, 1899 The Stillwater Gazette (weekly), part of the “Our County Public Schools Series” column (see this issue for a detailed history of the school district up to that time). DISTRICT FORMED Originally part of Lyman District #6 which likely formed in 1852. District #4 split off in 1870 and split again in 1896. GENERAL LOCATION Northeast of Twin Lakes in the town of May, in eastern Washington County. DISTRICT BOUNDARIES Big Carnelian Lake marks the western boundary, Little Carnelian Lake marks the southern boundary, and the St. Croix River marks the eastern boundary. An early school was moved down by the river at the corner of the main road between Stillwater and Marine and the road to Arcola, but it was burned soon after the move. Mr. Martin Mower then allowed school to be held in a house and later in a loft over a storehouse. In 1870, through the efforts of the numbers of the northern and western sections of the districts a division was made. In the spring of 1896 the district was again divided. The children in the western part of the district were unable to attend, some of them having five miles to come to school and over very poor roads. A great deal of opposition was met with at first but being very persistent in their efforts the division was made and is known as District No. 74. A new school was built after the 1898 Gazette article was written. 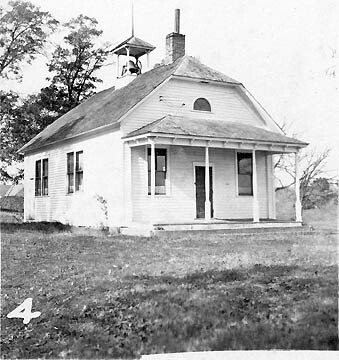 The school was closed by 1952 when the school survey was published, from which the photo below was taken. In 1898 there were 45 pupils and the average distance that they ahd to travel to get to school was one and a quarter miles. Consolidated with Marine District #4 and others in 1955.